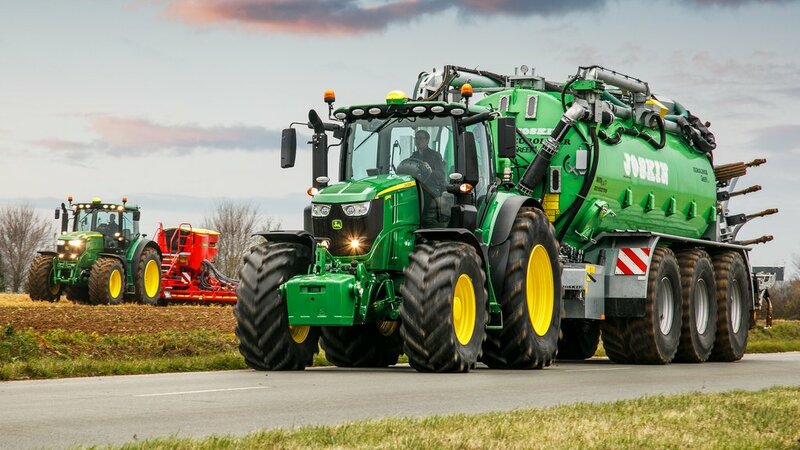 A recent event in Mannheim, Germany, saw the launch of one of the worst kept secrets of 2016, with John Deere officially revealing new 6R tractor models. James Rickard reports. 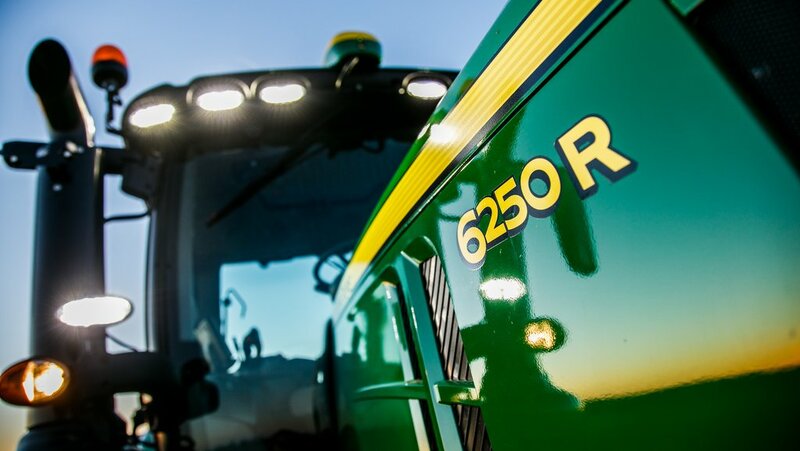 Development of the new John Deere 6230R and 6250R models have very much been customer led. 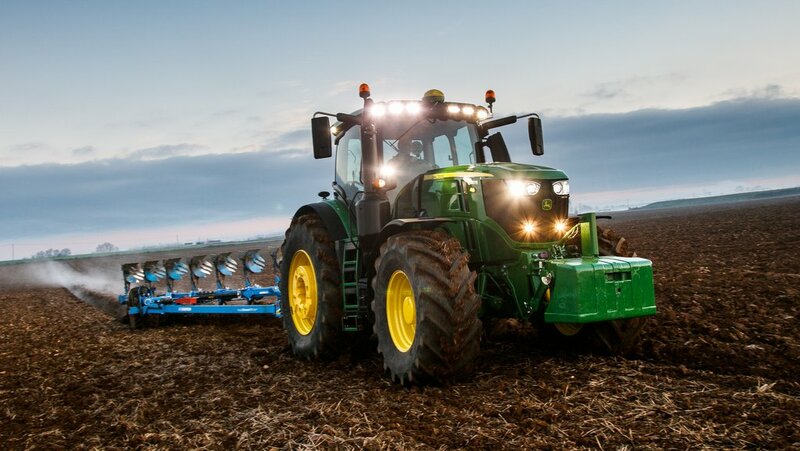 After months of teaser pictures floating around the internet, John Deere has officially launched more powerful 6R tractors. Extending the 6R range to 11 models is two new models; the 6230R and 6250R with rated power levels of 230hp and 250hp respectively. A boost function sees the 6250R pump out 300hp, giving it a power to weight ratio of 31kg per hp. A lightweight, powerful, versatile package was the key design mantra behind the new tractors, which have been specifically designed with European contractors in-mind. 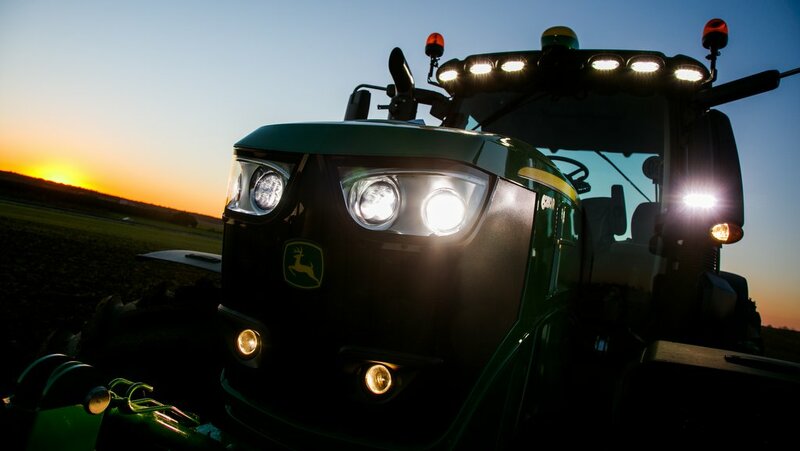 To that end, JD consulted with 10 major contractors, who between them operate 255 tractors of various makes and employ 428 people, from around Europe to draw up the ‘perfect’ all-round tractor. Demand for such a tractor soon became apparent after the original launch of the 6Rs back in 2011. 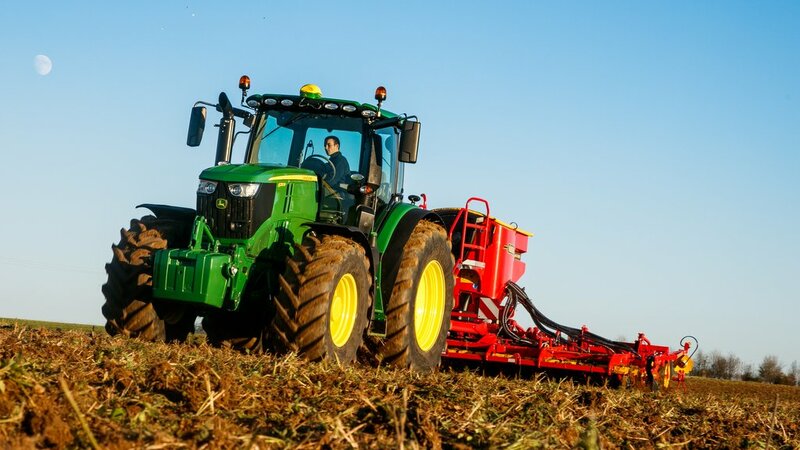 While JD offers 230hp and 250hp in its 7R range, these larger and bulkier models do not quite suit everyone, says Deere, with the 7Rs being more suited to heavier duty arable tasks. As such, JD needed lighter versions to cover all customer bases. It should be noted these two new models will not be replacing any current models but are additions to the line-up. They can be ordered now, with full production starting next summer. First world-wide public showing of the new models will be at Lamma. 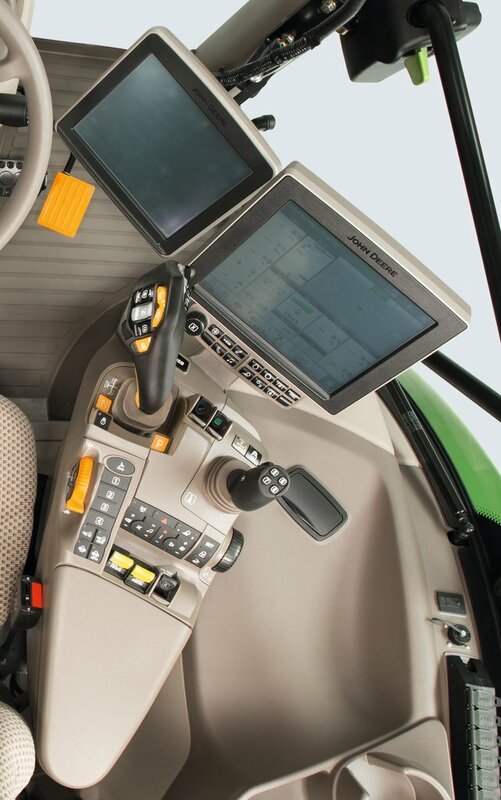 One of the stand out features of the new models, and one which sets them apart from any JD tractor, let alone its 6Rs, is the new CommandPro control concept. 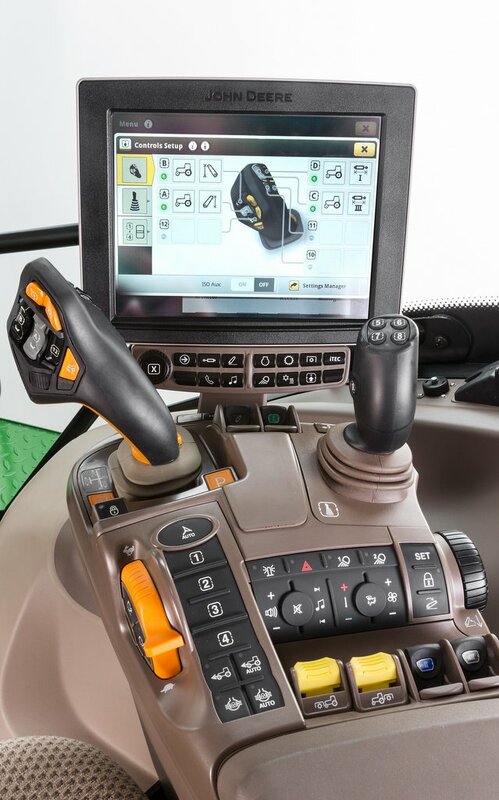 Available as an option, the joystick-based concept offers control of both drive and a multitude of tractor and implement functions. Returning to centre each time the lever is pushed or pulled, the lever takes care of speed, direction and cruise activation. It is blatantly obvious this is heavily influenced by a certain Bavarian manufacturer. However, JD has added a few extra touches such as an inching function which allows you to easily control the tractor at very low speed when hitching up to an implement, for example. It also includes a nifty feature for achieving top speed without having to hold the lever forward until it gets up to speed, which sees you push the lever through a detent then let go and leave the tractor to get up to speed on its own. Conversely, the same technique applies when you want to bring the tractor to a standstill – when it comes to a stop it will also hold itself, regardless of slopes. Alternatively, the tractor can be driven using the pedal. No selection of either pedal or ‘stick mode is required, just use which one you want and the tractor will recognise this. 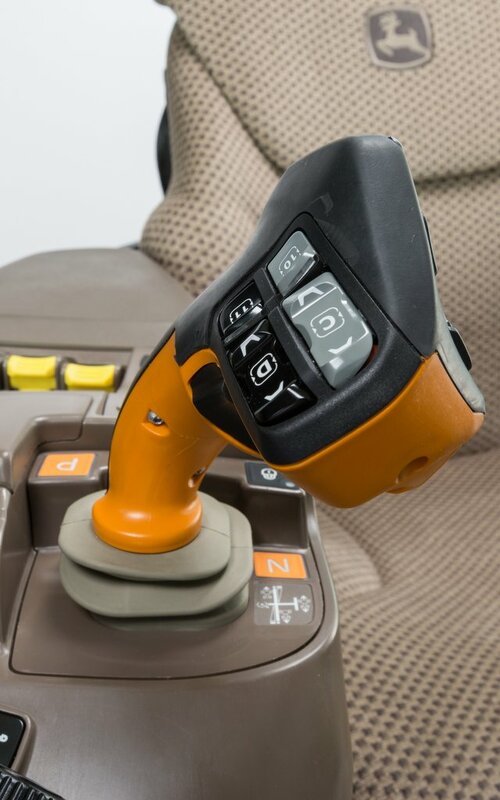 As for tractor functions, the joystick incorporates no less than 11 buttons and rocker switches which can be assigned any tractor function including front and rear linkages, ptos, spool valves, headland management, auto-guidance and IsoBus functions. These can be assigned via the tractor’s standard touch screen terminal, and saved and recalled at a later date. In the future, the CommandPro concept will eventually filter throughout other tractor models, possibly even self-propelled foragers and combines, depending on the acceptance and uptake of the concept. If it was not for the model number, you would be hard pressed to tell these are new tractors. However, several elements, particularly in the powertrain, have had to be heavily revised to handle the extra power. More than just a case of turning the wick up, the twin turbo 6.8-litre John Deere PSS engine, also found in the smaller 7Rs, features a reinforced crankshaft and pistons. It also gets a viscous driven fan which only kicks in when necessary, saving power and fuel, says Deere. As a result of the extra heat produced by the more powerful engines, larger cooling packs have had to be fitted. This has had the knock on effect of a taller bonnet and the air intake and air cleaner have had to be relocated outside of the bonnet, near the cab’s left hand A-pillar. In addition, overall height of the tractor has had to be increased to maintain visibility over the bonnet. Making daily servicing easier is a new maintenance hatch which allows better access to the engine dipstick and oil filler. As an option, electronic checking of oil and coolant levels can be specified. 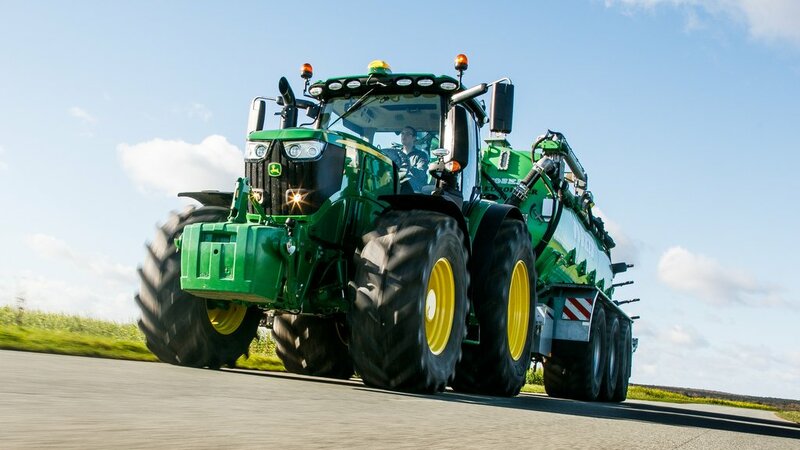 To release all 300 donkeys for transport applications, the 6250R has to be travelling above 13kph, at which point extra power starts to kick in gradually, with full power available above 15kph. For pto work, full power is available from 1kph and above. The new tractors are only available with a continuously variable transmission - AutoPowr in JD language. Due to the increase in power, the next model up in transmission supplier ZF’s portfolio is used, the Eccom 2.9 (a 2.4 is fitted in the 6215R). As a result, the larger transmission adds 100mm to the wheelbase, increasing it to 2.9m long. To save weight, but keep up strength, the rear differential is made from a high ductile cast steel. Extending the new tractors’ usage, both front and rear linkage lift capacities have been uprated to five and 10.4 tonnes respectively. In addition, a Category III top link is now available for the front linkage. Front linkage is standard, which can be specced with a 154hp pto and two, double-acting spools. To cope with the extra lift capacity and more power, the front axle and suspension unit has been uprated, which now uses double acting outboard suspension cylinders, similar to those found on the larger 7Rs. Developed in conjunction with Dana, it features 100mm of suspension travel. Larger tyres, up to 800/70 R38s at the rear and 600/70 R30 at the front, can also now be specified. Hydraulic flow is increased to 160l/min at 1,500rpm, and oil takeout has been increased to 80 litres, facilitated by the introduction of an extra tank, fitting snugly around the right-hand trumpet housing. Likewise, fuel tank capacity has been upped by adding a similar tank on the left had side, totaling 470 litres. As with other large framed 6Rs, the same rear-end structure is used, which can be specified with five spools and power beyond, or six spools. An ABS socket can also be added. For the rear linkage, dual sway hydraulic stabilisers are now an option, and linkage width adjustment has been made easier through the use of pin adjustment, enabling quick switching between Category II and III. A hot topic which arose from the contractor consultation was the lack of space for a proper toolbox. This has now been addressed on the right hand side of the tractor, just under the cab, with a large lockable compartment. Finally, all 6Rs can be specified with a no-cost five-post cab option, featuring a smaller door and an opening window on the left hand side.